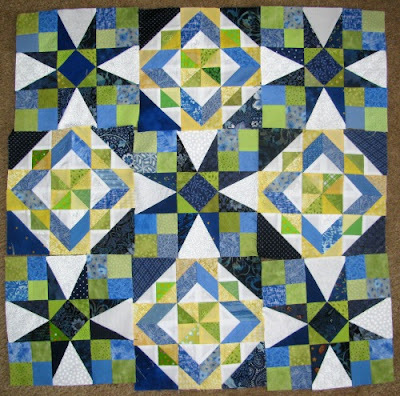 I pulled out THAT project again -- the one from December of 2013 when Bonnie Hunter began the Celtic Solstice mystery quilt. This time I made some good progress. 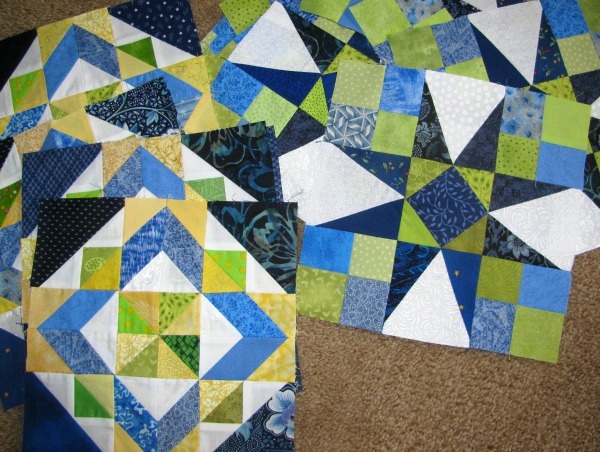 Here are a few of the blocks laid out as they will be sewn. I find myself second guessing my colour choices, but all in all, I think I like the way it works! For now all the blocks are back in their bag, and I was able to return the extra fabric to the stash bins. One of these days I'll take this to a group Sew Day. Sewing all the blocks together to make the top will be the perfect project to work on while sewing with friends. I think your colors,are terrific. Wait until you sew them together. The movement will be incredible. Make sure you finish it. I lover your colors! Very pretty.